You will be given a reference e-book to read which has 320 pages And the test will be based on that e-book , you can take final test within 1 year of purchase. Bartending refers to the process of serving beverages to customers of a licensed bar. This task is primarily done by a bartender who is also popular for its other names barmaid and barkeep. Bartending encompasses the process of mixing and serving drinks including cocktails, liqueur, liquor, wine, beer and coolers. Non-alcoholic beverages including juice, pop and water are also served to customers who are not planning to drink any alcohol like a non-drinker or a driver. If you want to become a professional in the field of bartending, then be aware that your tasks do not only include mixing and serving drinks because you are also responsible in taking the payments of customers, making sure that the glassware and liquor supplies in the specific place where you are working are stocked, maintaining the cleanliness of the area and maintaining sufficient amount of ice and garnishes. If you want to work as a bartender, then it is also important for you to make sure that you dress appropriately to ensure that you add to the lively atmosphere in a bar. You may also take part in flair bartending which is a huge help in entertaining more customers. You should also have the ability to mix different types of drinks to increase your chances of continuously pleasing paying customers in a quicker and more accurate manner. It is also advisable for you to improve your communication skills as there are times when you need to talk to your customers and let them enjoy a friendlier conversation. If you are greatly interested about becoming a certified bartender, then enrolling in the bartending certification program which is now part of the many online certification courses that Brainmeasures offers can help you out. 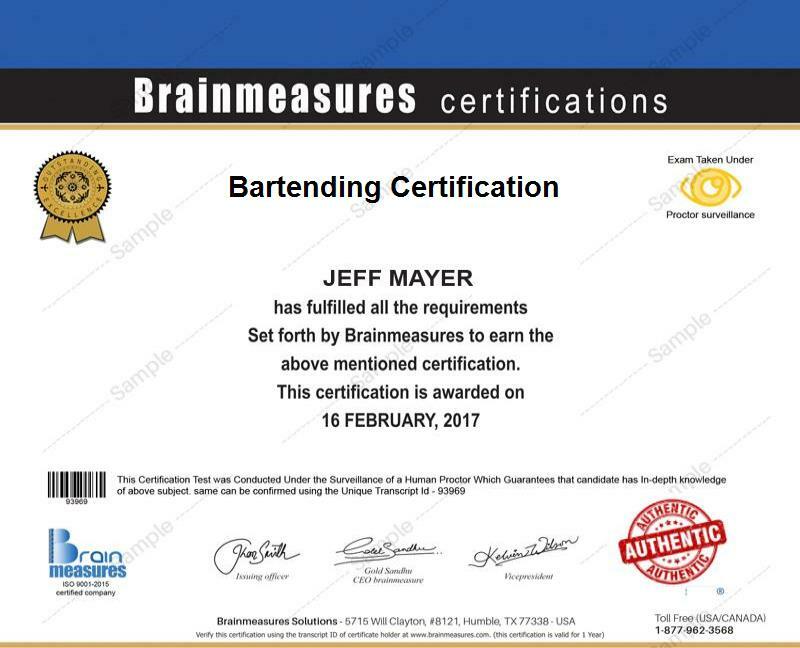 The bartending course offered by Brainmeasures is developed in such a way that you will no longer have a hard time honing your bartending skills and significantly enhancing your knowledge about the different bartending techniques that you can use. This certification course gives you the chance to access a kind of bartending training which is guaranteed to work in improving your knowledge about the different bartending and cocktail concepts and terminologies, bar tools, mixers and homemade liquors, garnishes and drink embellishments that you can use and the types of distilled spirits. Because of the proven comprehensiveness of the bartending certification course offered by Brainmeasures, receiving your certificate from the company is guaranteed to enhance your skills and knowledge in the field. The bartending certification program which is now part of the many offers of Brainmeasures is capable of benefiting a lot of individuals and professionals. While there are those who want to learn bartending to get a career in this field, there are also those that use their bartending skills and knowledge as a hobby. You should consider enrolling in this certification course if you are an aspiring bartender who wishes to significantly enhance your knowledge about the most advanced bartending techniques that you can use and the different tools that you should collect in order to serve the best drinks and offer the best bartending services to your customers. Working as a certified bartender after earning a bartending certification also increases your chances of getting more stable jobs with higher pay. As a bartending certification holder, you may decide to work on an hourly basis which gives you the opportunity to earn around $5 to $18 per hour and this will significantly increase based on the amount of tips offered by your customers. Basing on research, certified bartenders usually earn at least $42,000 per year which is already a pretty good amount for a very fun job.